Decorating the White House for over 68,000 guests is a mammoth task. An army of volunteers along with countless White House staff work feverishly to create a magical experience for all visitors. My volunteer assignment this time was the Blue Room which has the largest tree in the White House, topping off at 18 feet and one inch. 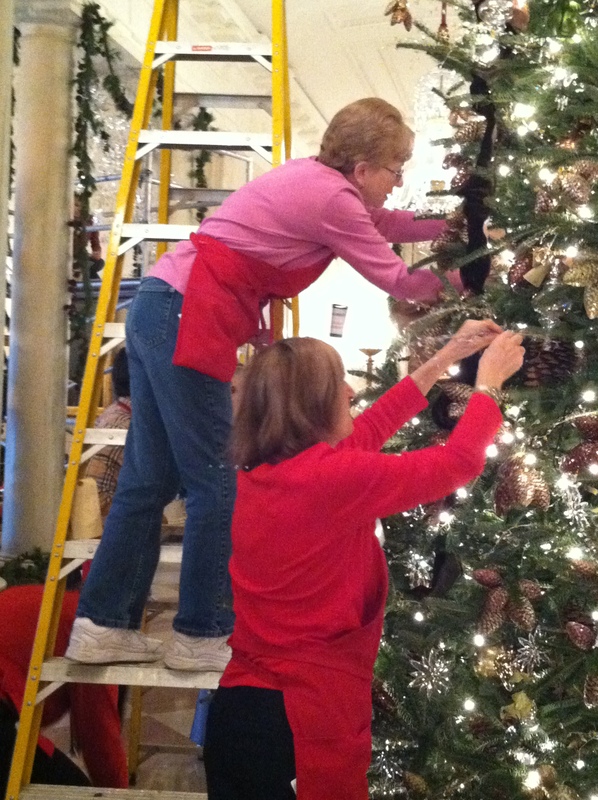 Volunteers were scattered all over pitching in where needed, clambering up scaffolding and ladders to get every ornament and wreath hung in time. 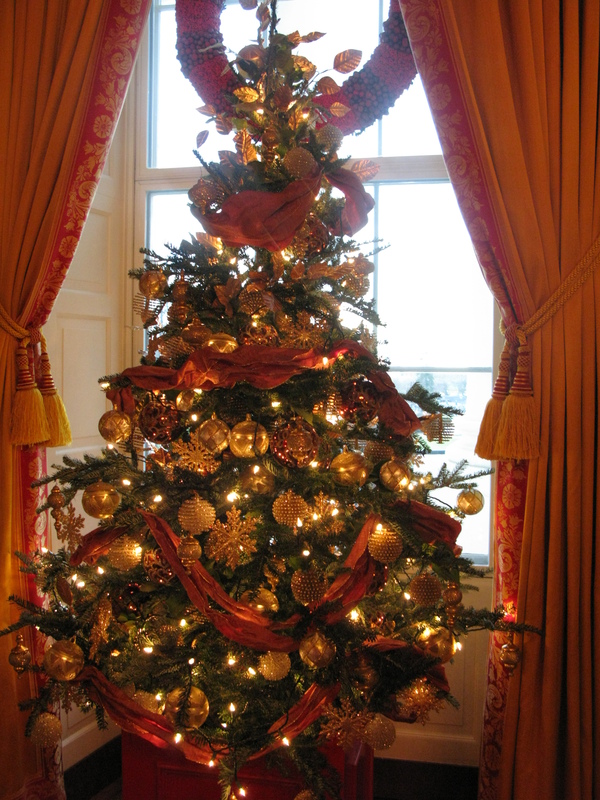 To read about my first time at the White House in 2011, go to Decorating the White House for Christmas . 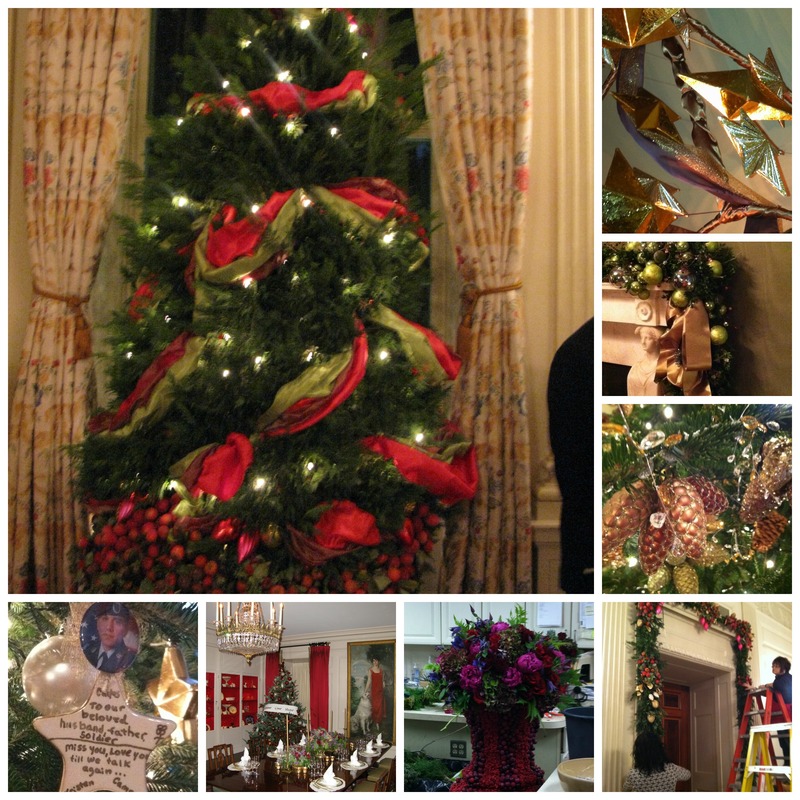 Check out Decorating the White House, 2015-Part 1, if you missed my first post for this year. Volunteers start working in a warehouse a couple of days in advance of working at the White House where I was assigned to the “bow team.” I can make bows in my sleep and I am always surprised by people when they have trouble with this task. It was a pleasure working with the sumptuous ribbon to create bows and garlands for all the sixty-two trees and assorted mantels in the White House. My team created multi-layered bows and garlands for two straight days before going to the White House to start decorating the rooms. 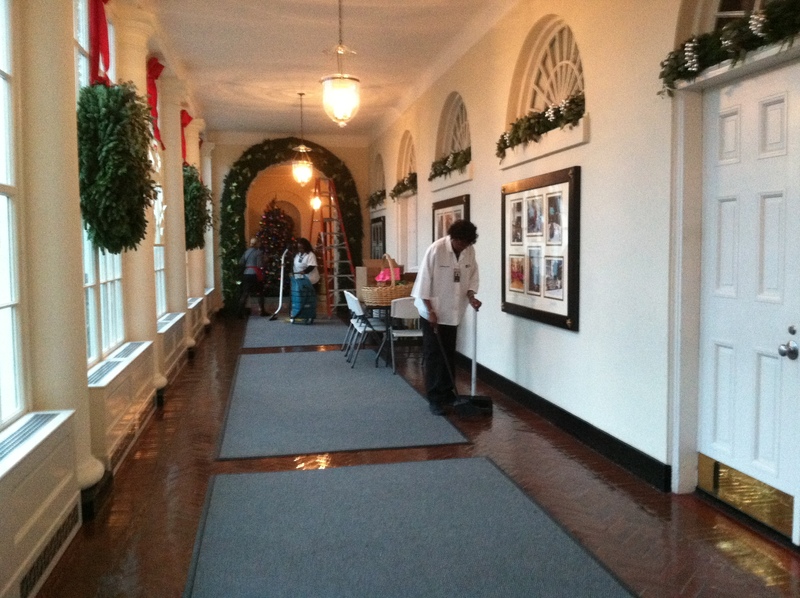 Boxes of wired ornaments and other decorating items were delivered to the White House in hundreds of carefully marked boxes the morning that we started. Continuing our tour of the White House, from the ground floor you ascend steps to the main State floor which includes the historic East Room, the largest room of the White House. Greeted by four imposing fir trees covered in frosty icicles, shimmery white and silver ornaments and dancing reindeer, the whole room sparkled. Displayed against one wall is the ornate historic crèche or nativity scene made of terra-cotta and carved wood. Fabricated in Naples in the eighteenth century, the crèche was donated to the White House in the 1960’s. The Green Room was probably my favorite decorated room (besides the Blue Room which was my team’s job! ), because of the peacocks adorning the mantel and trees. Jewel tone ornaments were coordinated with the emerald silk covered walls. A historic meeting between first Lady Eleanor Roosevelt and Amelia Earhart took place in this beautiful room. Teal, emerald-green, and purple colors dominated this room. I spent several days working in the Blue Room as my assignment and I was “star struck!” Stars were the overall theme in the room-wreaths, tree, and even the stanchions that surrounded the tree had stars. Holding the largest tree, at eighteen feet and one inch tall, the Blue Room tree comes from the famous Bustard’s Christmas Tree Farm in Lehighton, PA, only about a two hour drive from me in Maryland. 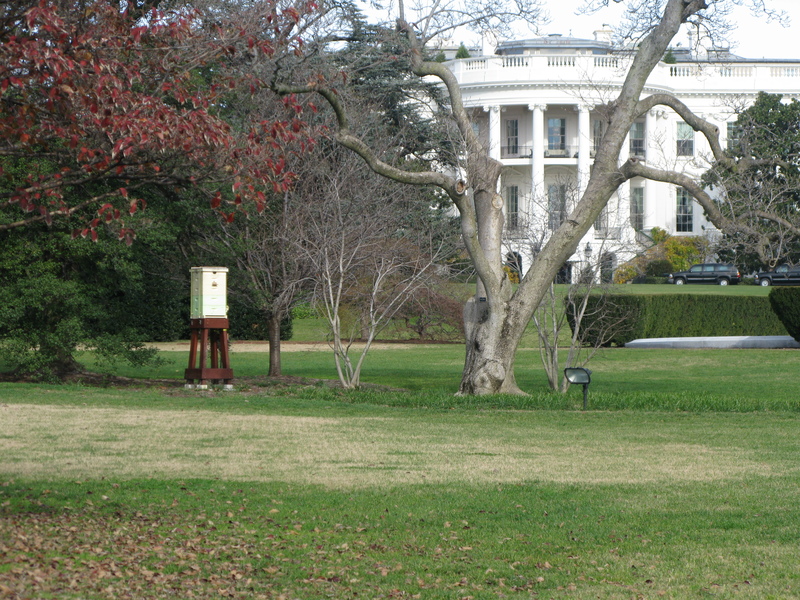 An oval room, the Blue Room is primarily used by the President to receive many of his guests. Ornamented with a beautiful 6 inch wide silk ribbon overlaid on top of large gold stars, the tree is a shimmering display of red, white, and blue, inspired by the U.S. flag. It took our team a full three days to completely decorate this monster tree, using ladders and scaffolding and lots of patience. Families of the military were asked to write messages to their loved ones and the messages were beautifully inscribed on a wide silk ribbon that wound around the tree. After Christmas, when the decorations are dismantled, the families will receive the snippet of ribbon with their note. 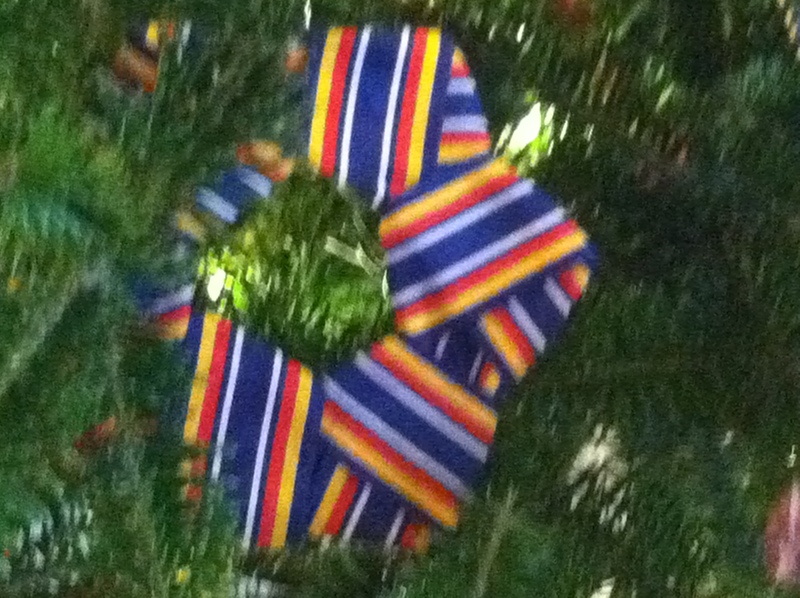 I helped design and construct the three star wreaths that hung in the Blue Room windows. 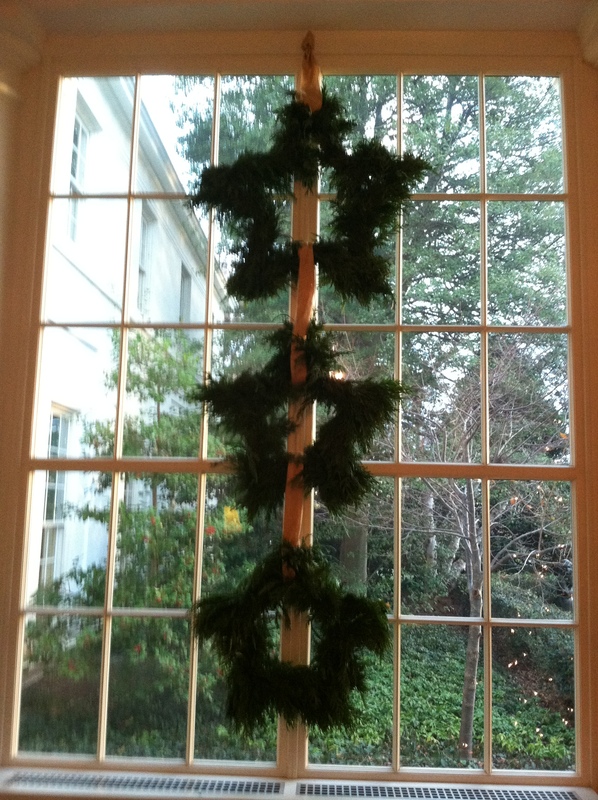 Up high on a ladder, I wired the large stars in place and suspended stars from ribbons on the wreaths. In 2011 when I was part of the team to decorate the Red Room, I really enjoyed the color scheme and rich decorations for this ruby colored room. In 2015, I was interested in how the decorations would change. 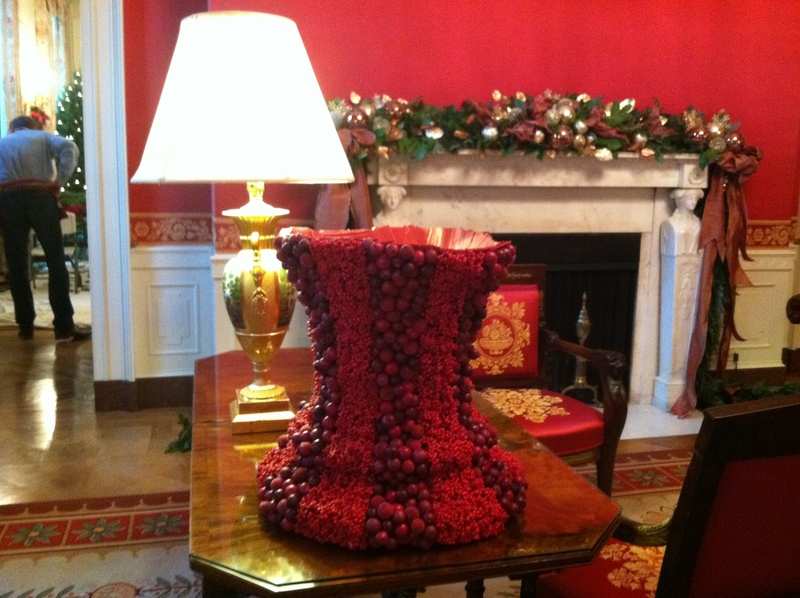 Cranberries were still used in the wreaths and in topiary trees elsewhere in the room-no surprise there! This year though, different shades of red and gold were interwoven into the tree and mantel and the beautiful striped garland was striking. Magnolia leaves were also a nice addition to the mantel. The cardinals on top of the tree were perfect. The first Christmas party in the State Dining Room was hosted by President John Adams and his wife in 1800, so like the rest of the White House, there is a lot of history here. Seasonal delights, such as the imposing gingerbread house with Bo and Sunny perched in front, is probably the star attraction. Close to 500 pounds, the gingerbread house has more than 250 pounds of gingerbread dough, 150 pounds of dark chocolate, 25 pounds of gum paste, 25 pounds sugar work, and 25 pounds of icing. I liked the small groupings of snow people on either side and there was a small White House garden to one side. Nearby, a large gumball machine full of treats is on display along with the many nutcrackers and toys, sure to delight the younger children who visit. The Grand Foyer held my favorite designed trees, which flanked the Blue Room. Imposing fir trees arrayed with giant glass balls and stars arranged with a very heavy gold ball garland positively glowed with color. 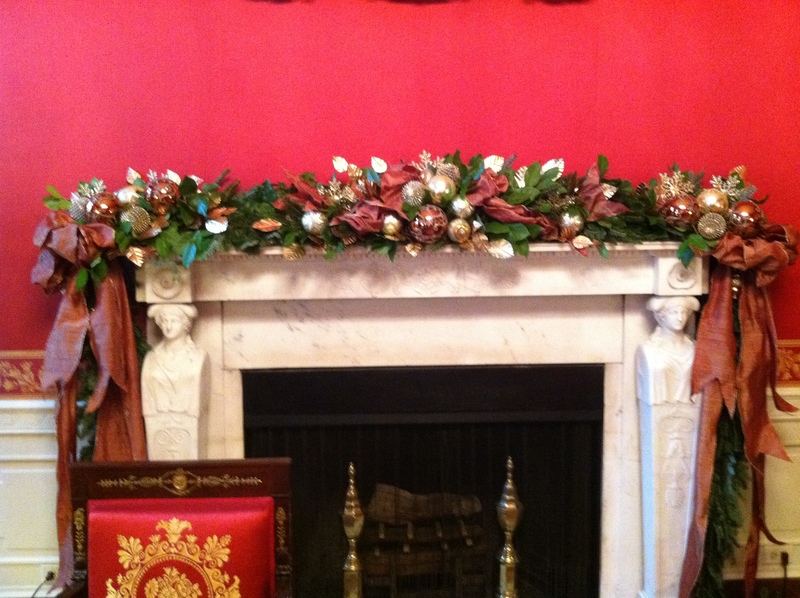 The use of ball garlands used in several areas of the White House created a rich layered look and each one was wired in by hand so that they stayed put. To finish off my week at the White House, all volunteers with one guest received an invitation to a special evening reception with food and entertainment. Tables in the Dining Room and East Room were laden with all kinds of food and drink. The dessert table was especially appealing with iced cookies, sticky pudding with caramel sauce, yule logs, cakes, macaroons and other special treats. Smoked salmon, crab claws, carved roast beef and ham, and the famous mac with cauliflower and cheese were enjoyed by all. The First Lady welcomed all the volunteers and graciously thanked everyone for all their efforts in making the White House a magical place. I met lots of new people, learned some great tips on decorating in a grand manner, and had some of the best food of my life. I will never forget this Christmas! 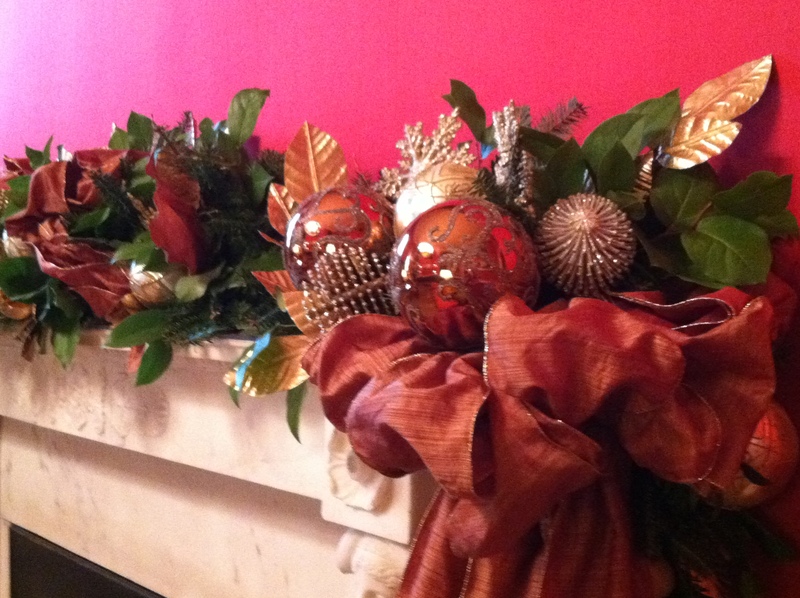 Next: How to decorate you own mantel like the White House! To follow this blog and get regular updates, click on “Follow” in the right hand column. Decorating the White House is every designers dream come true. I had a second chance to take part in this one of a kind volunteer event again in 2015! 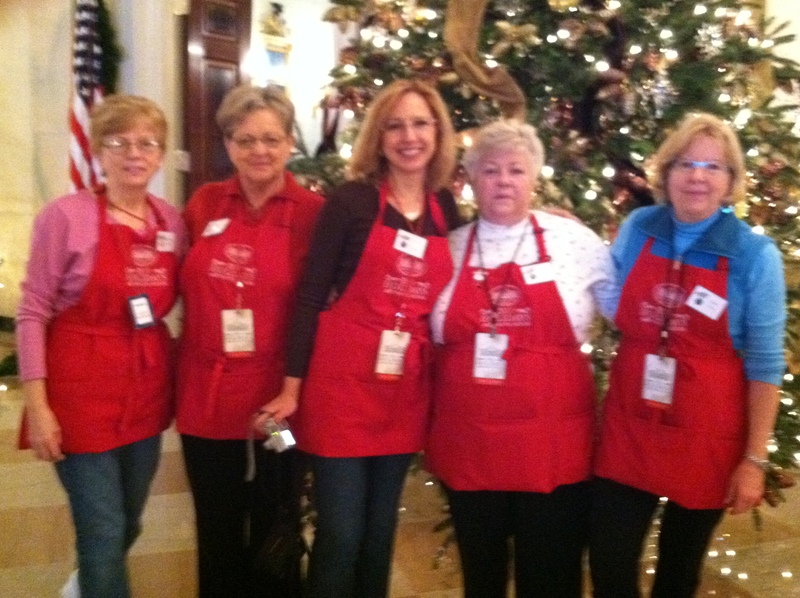 Read about my first time in 2011 at Decorating the White House for Christmas. Anyone can apply by going online to https://www.whitehouse.gov/, filling out the form and add a short essay with pictures of your work and by October you will find out if you made the cut. I’m sure that the White House Social Office gets thousands of applications from all over the country and it must be tough to choose the lucky people. When I opened the acceptance email from the White House Social Office, I couldn’t believe my luck in participating again! This season’s theme A Timeless Tradition, inspires visitors to celebrate deeply rooted Christmas traditions while also creating new memories. Combining the old with the new was the trademark this year. From my time working in 2011, the decorations just keep getting more elaborate and over the top with stunning displays of creativity. Sixty-two firs fill the White House with over 70,000 ornaments to create the magic. Work, Work, and More Work! It takes tons of volunteer hours to make the magic happen. I spent a week in D.C. starting on Thanksgiving evening in a hotel a couple of blocks away from the White House. Everything is at my expense- hotel, transportation, time, and most meals (the White House fed us very well at lunch). Taking on this task is a real commitment of time and money but well worth it. Everyone who accepts the challenge knows that this is a chance of a lifetime. Getting up early to meet at 6:30 AM every morning isn’t my idea of fun normally, but when you’re on a mission to decorate the White House, everyone is so psyched that you jump out of bed ready to go! Five days of decorating later, the White House treats you and a guest to an evening reception with such a fanfare of food and entertainment that you gasp as you see everything in place. A giant penguin family greets you as you enter the East Visitor Entrance. When you visit the White House, there are layers of security to go through. I had a gorgeous formal invite as a keepsake but did not need that in hand to enter. Standing in line for two plus hours until the gates opened ensured that I was close to the front of the line to get an early peek and take some memorable pictures before it gets too crowded. As you enter the East Landing, a sea of snowflakes shimmer overhead. Each of the fifty-six states and territories are represented with a dangling snowflake suspended from chicken wire. Your wintry stroll continues along the whole length of the East Colonnade until you tear your eyes off the ceiling and glance to the left into the East Colonnade garden. There, an army of snow people gaze in at you. I stopped to take pictures of this magical constellation of unique frozen snow people with the traditional smiley faces and scarves. Again, there are fifty-six snow people representing all the states and territories. The snow people were extremely heavy and awkward to move around in the Jacqueline Kennedy Garden. Redesigned in the Kennedy Administration with Littleleaf linden trees and Kennedy saucer magnolias bordered by low hedges of boxwood and American Holly, events and parties are frequently held in this semi-formal garden. Dedicated to serving members of the military, and those who have made the ultimate sacrifice for our country, the East Landing greets you with a gorgeous tree and mailboxes. Visitors are invited to pause and send a message of thanks to our troops with the array of mailboxes and air mail envelopes. Volunteers spent many hours making garlands and wreaths out of the airmail envelopes by stuffing them with card stock and stapling them together. A place for the furry residents is next. Sunny and Bo, the First Pets, are both Portuguese Water dogs. 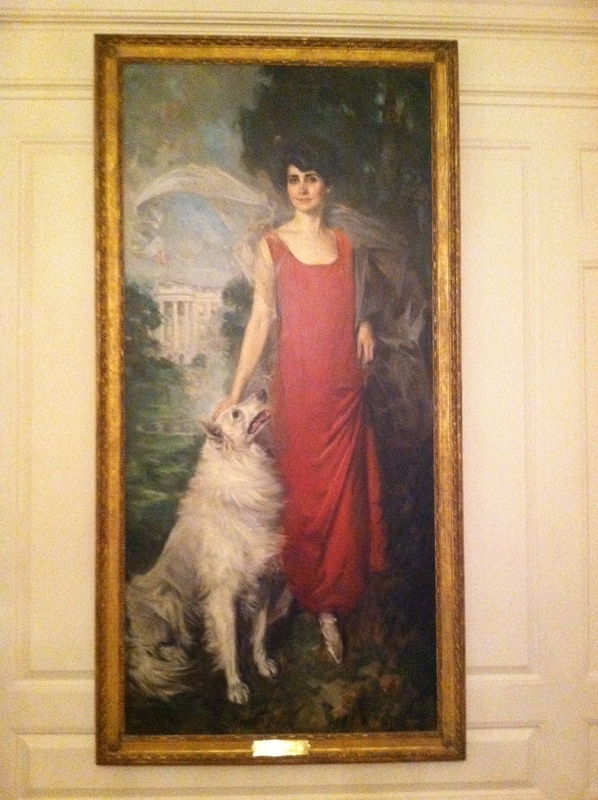 I pet and admired the dogs during my time at the White House. 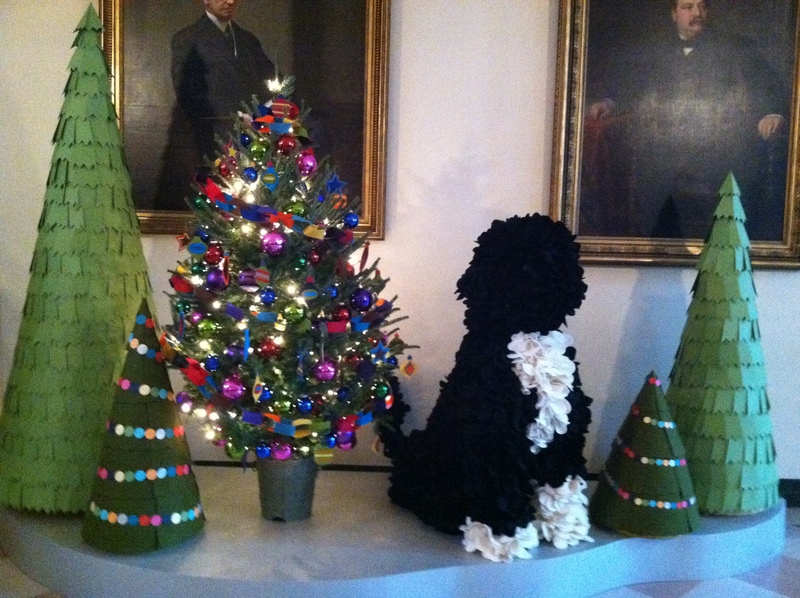 The dog-themed tree, giant dog bed, tennis ball wreaths and trees were the perfect accessories for them. Constructed of over 55,000 feet of black yarn that was wound into 7,000 pom-poms, larger-than-life Sunny and Bo greeted visitors to the White House. These pom-poms were the result of many hours of work by volunteers! The Night Before Christmas poem hung on the wall, altered to reflect the antics of the First Dogs. And the first Dogs were prancing, playing fetch down the halls. Decorating for visitors soon to be here. While visions of tennis balls danced in their heads. The pups fell asleep much like the giant yule logs. Pushed open the doors, to the Rose Garden they dashed. ‘Twas the return of the Commander in Chief. They knew what this meant-a night of great fun. Knowing holidays with friends is good as it gets. What a magical moment for Sunny and Bo. The family sends warms wishes for the best holiday! Containing works of fiction to first-hand accounts of important moments in our Nation’s history, books dominate the library’s walls. Gold covered books were added to the shelves to add a holiday touch and decorations placed on the tables to make the library a festive place. A holiday forest of Christmas trees were arrayed and decorated to celebrate the American story. Displaying a collection of gold-plated silver, the Vermeil Room or sometimes known as the Gold Room, displays several First Lady portraits and contained one of the most striking Christmas displays. Patchwork stuffed teddy bears, both large and small, with beautiful shell trees and miniature scenes were whimsical and creative. Originally, the Vermeil Room was used as a staff work room for polishing silver and storage. Used to display Presidential china in built-in cabinetry against a bright red background, the China Room is one of the most beautiful and memorable rooms in the house – without any decorations. The china collection is arranged chronologically beginning to the right of the fireplace on the east wall. A good portion of the china goes back to the early nineteenth century. The Diplomatic Reception Room is one of three oval rooms in the White House and located next to the China Room. Used as a reception room for foreign ambassadors, the most interesting feature is that a previously unused chimney was opened up in 1935, and a new mantel and fireplace installed for Franklin Roosevelt’s famous “fireside chats.” The room has four doors leading to the Map Room, the Center Hall, the China Room, and a vestibule that leads to the South Lawn. If you want to receive my weekly posts in your email, click on the Follow space in the right hand column. Dressing up a lemon cypress tree with a beautiful birch bark container is a simple but amazing decoration that anyone can do. You don’t need any flower arranging experience at all, but just need to find the right materials and slap them together. Lemon Cypress is known scientifically as Cupressus macrocarpa ‘Goldcrest’. Native to California, Lemon Cypress thrives in USDA hardiness zones 7 through 10. Fragrant lemon scented foliage sets this evergreen apart from other evergreens and I love to rub the foliage to get a whiff of it. Dwarf varieties do great as an ornamental in small pots. Larger trees are an interesting alternative to the traditional Christmas tree. Thriving best in an indoor location that gets at least five hours of full sun per day, be sure to keep them in a sunny window. Keep the soil moist but not soaking wet. Feeding on a regular basis with something acidic like Miracid, used for acid loving plants, will keep them happy. Do not over feed them. Especially susceptible to aphids, Lemon Cypress should be sprayed at the first sight of these pests which leave a black, sooty substance on the tree which can occur almost overnight. Pruning on a regular basis is essential to keep a Lemon Cypress in maintaining their natural pyramidal shape. Pruning is so important, that if the cypress is not pruned it will go brittle quickly and die. I use Lemon Cypress in Christmas arrangements often as they are a pretty gold color and a beautiful shape. One variation is below. The Cypress tree lends itself to almost anything you want to add from your garden. My Nandina foliage turned an especially pretty red this year and I added this along with the berries. Above, I used Winter Berries, red seeded Eucalyptus, and tiny Alder cones. Tiny star or snowflake battery-powered lights are easy to add to the tree, fastening the black control box to the back of the birch bark with glue dots. Once finished with your creation, you can place it on a mantle or table top for instant glamour. Picking up an inexpensive Poinsettia from the grocery store and taking them apart to use as cut flowers is a great way to use these long-lasting flowers. Read about them at Poinsettia-History and Legends for a fascinating account of how they have become the worlds most popular flower. To use them, cut the branch off the plant, and sear the cut end with a candle flame, until the milky sap stops flowing. Once seared, place the flower into a water tube or vase, where they last up to two weeks. If you need some pizzazz for your outside entrance to greet visitors, create a live green arrangement with evergreens and twigs cut from your property. Jazz it up with something sparkly and you can leave it in place for weeks. Once I empty my large pots and window boxes at the end of November, I can dress them up again with greenery which will last most of the winter. I keep the soil in them as that is the glue which will hold my greens in place. Here I used a waterproof fiber pot filled with oasis, but a time saver is to use one of your containers filled with soil. Once I finish arranging in a fiber pot, I place the whole thing into an empty container. A trick that I have used for a long time which will get you started in a hurry, is to buy a pre-made wreath of fresh greens and build upon that as a base. Placing this wreath on top of the rim of the pot will hide most of the soil and you can stick your greens in and around it. Buy a ready-made or make your own. Start by placing your wreath horizontally on top and start adding your other plant materials. Once you insert stems through the wreath, that will anchor it to the container. For this container, I began with adding gold tipped Arborvitae. Stick the branches through the wreath into the oasis or soil. Insert Magnolia branches into the oasis along with yellow twig dogwood for drama. Add some red dyed seeded Eucalyptus for a pop of color. I finished it off with large branches of peach winterberry and glittery pine cones. Everyone loves to decorate for Christmas and after finishing decorating my house, I itch to do more! So I have always had a desire to decorate the White House but thought it was an impossible dream. But after watching the HGTV special last year and seeing the army of volunteers that are busily hanging garlands and balls, I was determined to try. I wrote a letter to Michelle Obama right after Christmas and forgot about it. But in August I was thrilled to get an official letter from the White House Social Office informing me that I could fill out the volunteer application on line which I did right away. The application was pretty standard and asked things such as to list and explain in some detail your volunteer experience, and to send pictures of your work. 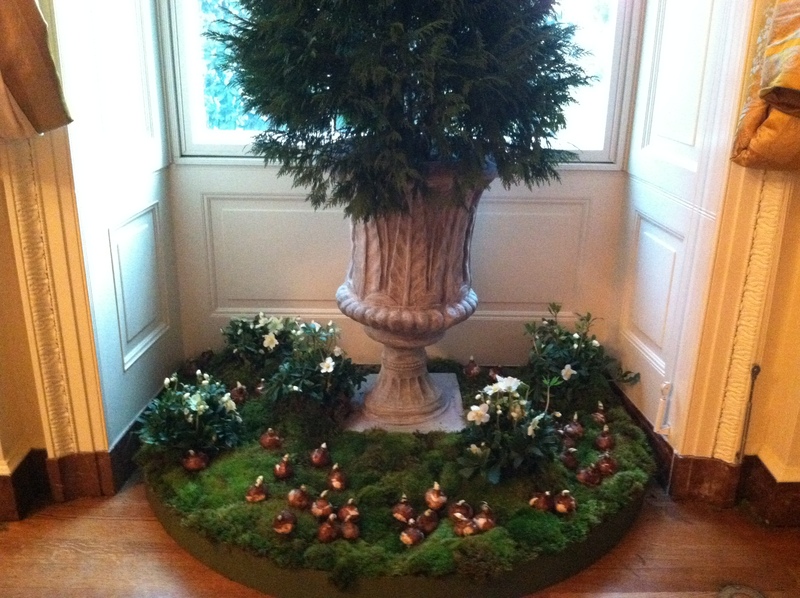 I have decorated Hampton Mansion for Christmas with my Garden Club for many years and hoped that that experience would help. In October I was thrilled to learn by email that I was accepted conditionally pending a security check. The Social Office also requested that volunteers not post to Facebook or blog about their experiences before the event but afterwards was fine. The reason was to keep the theme secret before “the big reveal” on November 30th. The theme was to be kept secret until our opening reception on the 30th but we suspected that it was a military theme. Once I learned that I was accepted, I started to get emails from AgencyEA, an event planning company based in Chicago. AgencyEA is known for planning Ophra Winfrey’s events so I knew that they must be good. AgencyEA reserved blocks of rooms in two hotels that were within walking distance of the White House with a really good rate as it can be quite expensive to stay in D.C. I made arrangements to stay at the Donovan House for 6 nights and planned on checking in on Thanksgiving night. After eating dinner at my brother’s house, my husband and I drove into D.C. and checked in to the hotel and met some of my fellow decorators and people from AgencyEA. I got a red badge, red work apron, and room assignment- the red room! The Agency told everyone that we would be working for 2 days at an off site warehouse and then 3 days at the White House. I learned that I would be working with a team of 130 volunteers and AgencyEA employees from over 40 states. There were mother/daughter , husband/wife, and sister teams, and the youngest volunteer was 12 and the oldest was 80! After being told to report the next morning at 6:30 AM in the downstairs lobby to board the buses I turned in. The next morning, the drive to the warehouse lasted about 40 minutes and we arrived at a huge brick warehouse that the National Park Service rents and stores all the Christmas paraphenalia from previous years and other props used by the Park Service. It was fascinating to walk up and down the aisles and see what was there. There were pallets of stuff, such as lumber, corn oil ?? ?, sleds, silver bowls, large urns, plus tons of Christmas stuff. It was a veritable treasure trove of Christmas decorations- the mother load!!! But we were put right to work and there was a huge amount of work to do!!! I started out inventorying boxes of ornaments, taking the wrappers off of ornaments and removing the hang tags from balls and replacing them with wires. People are known to steal the ornaments from the trees at the White House so the balls must all be wired to the trees. We worked with the decorations that belonged to a specific room and made sure that everything was accounted for and placed in the loading area when we were done. It could take hours and hours to do a room depending on the size. I worked with a team of about 6 or 7 people. Each room had a “key” basket that contained an example of every kind of ball, ribbon, or branch used to decorate that particular room. A designer from AgencyEA had selected the colors and ornaments and ribbon months before. Someone from the Agency asked if anyone knew how to make wreaths and I volunteered because I preferred to make something rather than count and wire ornaments. 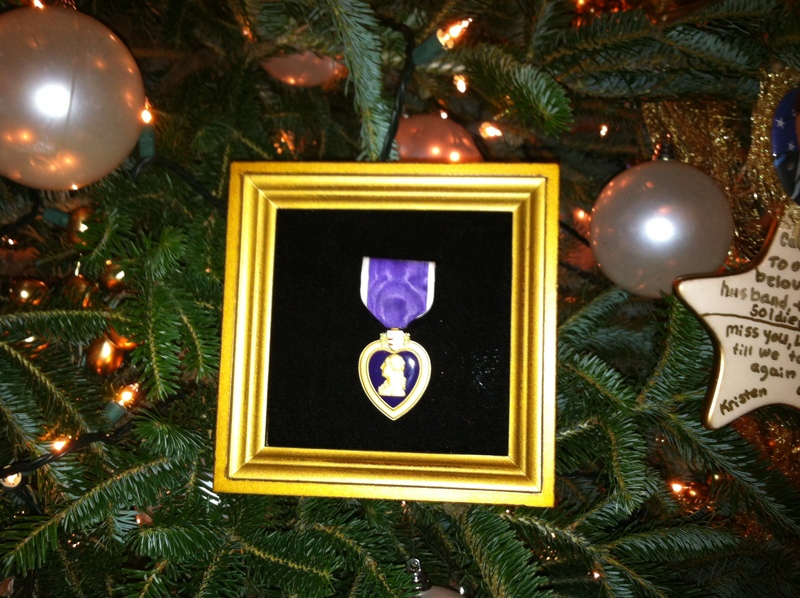 I was assigned then as the team leader for a group of 7 people to assemble 8 cedar stars about 3 feet in diameter that would be hung in the East room landing by the Gold Star tree. 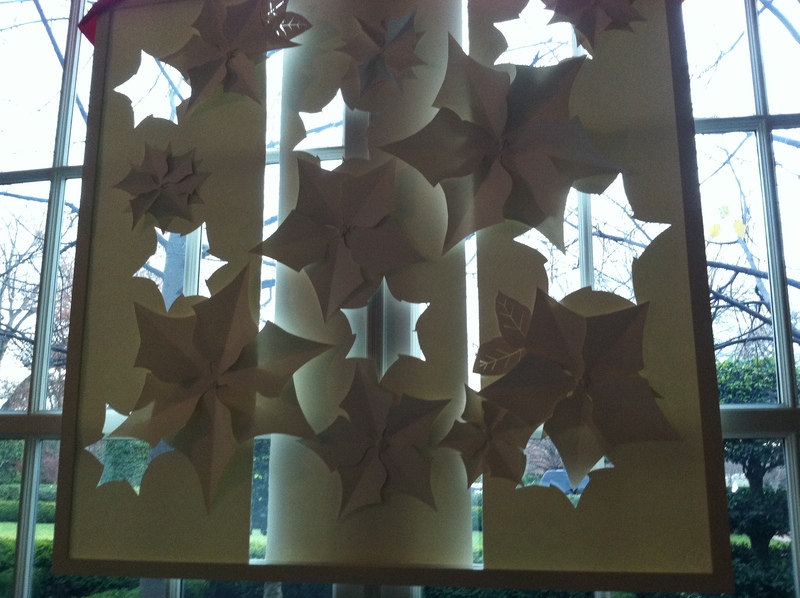 Since the cedar stars would be hung in the window, they needed to be double sided. After dragging 50 feet of extemely heavy garland over to our work station, we set to work dismantling the cedar garland and wiring the bunches onto the star wreath bases. The wreaths took all day and into the next as they were very labor intensive. Other teams were involved in a variety of tasks- making endless pine cone garlands, sewing felt poinsettia petals and leaves, unloading and sorting tons of fresh greens, making knotted wreaths out of military medal ribbons, constructing felt trees, and wiring hundreds of thousands of ornaments. Someone was even sewing on an ancient Singer sewing machine. The tasks were endless. Lunch was a festive affair with wraps, hot soup, snacks, desserts, and drinks. It felt good to be sitting down for a while! At the end of the day, we piled into the buses and went back to the hotel and collapsed. But we returned the next day and did it all over again, but at a more feverish pace because we had to get it done by the end of the day. By the end of that second day we all realized that the theme for the Holiday would be a military one as so many of the decorations were all about the armed forces. Here was the whole reason we all volunteered! To actually go to the White House and decorate. I met some of my new friends in the dark outside our hotel at 6:15 AM for our trek. 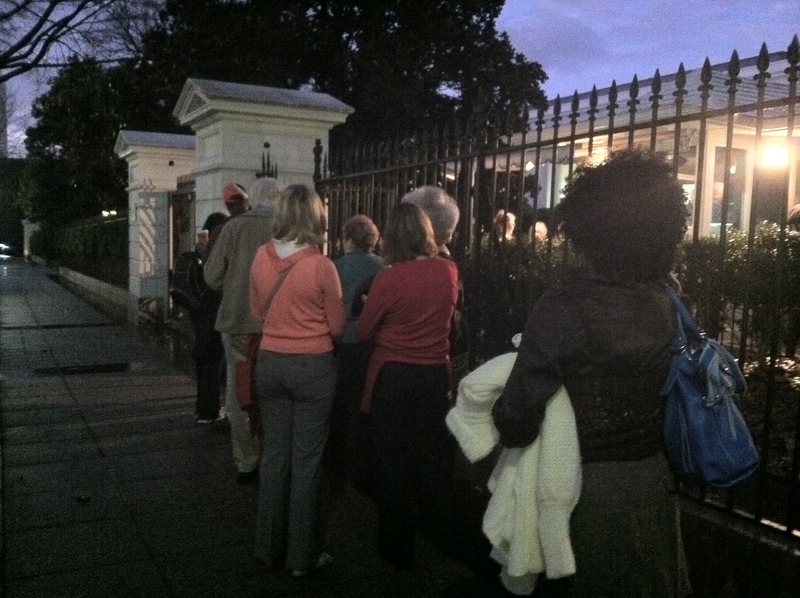 We walked 10 minutes to the White House and ended at the North East entrance for security check points. The Agency stressed to us beforehand that we needed our badges, name tags and a photo ID to get in. There were two security checkpoints to go through where they look at your driver’s license and check your name off of a list. You and your belongings have to go through a metal detector. It was pretty much like airport security except you could keep your shoes on. The security lines took about a half an hour and then we were in! We entered through the East Landing and were treated to coffee and donuts and figured out where the bathroom was. The entrance hallway is quite interesting with lots of candid photos from past and present administrations lining the walls. We were given a tour of the White House and met the Chief Usher, the Special Assistant to the President, the Curator, and the Executive Housekeeper. We were made to feel welcome and appreciated. The Curator stressed to us that the White House is a living museum and asked that we not touch or handle the furnishings. All of us were just in awe to be inside and wouldn’t think of touching anything! Our first task was to unload all the boxes that were delivered by truck to the White House and make sure that each labeled box was carried to the correct destination. Then we got to the best part –decorating! The Red Room is one of three state parlors on the first floor of the White House and is decorated in different shades of red. The walls are actually hung with burgundy silk. Usually the Christmas decorations are all bright screaming red but I was relieved to see that the decorator had taken a different tack and we were going to use copper, gold, dark red, wine, cinnamon, and touches of cream. I approved of the color palette! My job the first day was to decorate the Red Room with 5 other people. We looked through our “key basket” to see what materials we had to work with and started brain storming about the best way to get everything done. We had two 5 foot trees mounted in large red wooden planters, and a gorgeous Italian marble mantel with caryatid supports to decorate. For materials, we had beautiful glittery pine cone balls, yards and yards of 8″ wide coppery gold wired ribbon, gold leaf branches, fresh lemon leaves, 2 long balsam fir garlands, and assorted glass ornaments with some snowflakes. 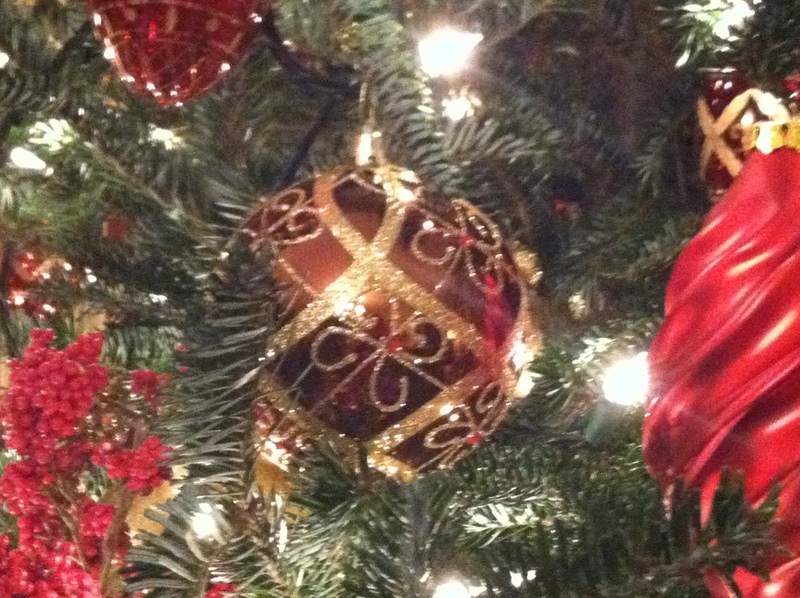 The ornaments ranged from a dozen large copper balls, smaller gold and white ones, to glittery tear drops. We were told to start decorating and we jumped right into it and made some very large bows for the mantels and adorned the garland on the mantel with an assortment of the ornaments. Then we started to decorate the trees with doubled ribbon garlands swagged around the trees. We put the larger ornaments in the center of the tree and filled in every available spot with the smaller ornaments. When lunch rolled around we strolled over to the formal dining room where a fantastic hot buffet awaited us. Salads, thick sliced ham, soups, breads, drinks and dessert were all available. The White House staff ate first and then we got in line. The kitchen staff was phenomenal! They must have known that with all the physical work that we did we would be hungry. A crew from HGTV with Genevieve was circulating around the rooms filming and interviewing people for the Holiday special that will be aired Dec 11. They talked to me for a few minutes while I was decorating the trees and had me sign a release form. After working all day, we left at 4PM to go back to the hotel and collapse.